The sign says do not enter but this is the new entrance into the Daniels building at U of T which I showed from the front south exposure yesterday. 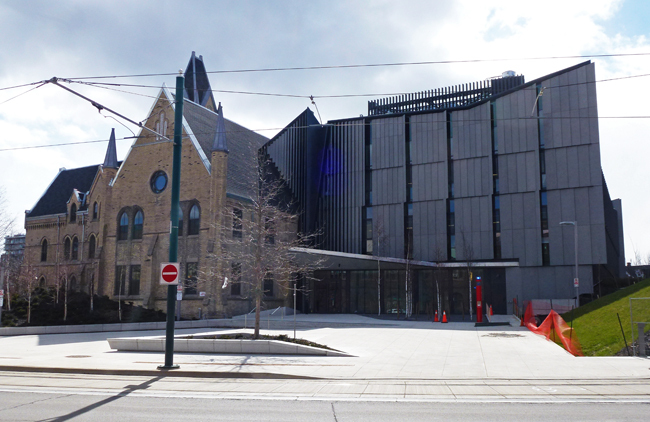 Here I have moved up Spadina Cres along the side to show you where the old Gothic Revival building meets the new modern half of the building. Our spring is very delayed and landscaping was still being put off when I took this pic. I like how they have joined the two architectural styles here. I dunno, Pat. This looks pretty weird. Maybe if I saw it in person. Or maybe I just much prefer the Old Gothic Revival architecture. It's strange. Nice photo, though! So glad to hear that you and yours are OK.
Wow, that is a huge addition and I'm impressed at how you can't see it at all from the photo you posted yesterday. Yes, it seems a bit off. I think I'd have to see it in person. Gosh you would never even guess the extension was there from the front Pat! I don't mind it.. I think they've done an amazing job! I wonder what it would have cost to do the extension in the old style? 10 times as much? It is an interesting view! To fit old on new ask for a special treatment but of course not without its troubles. That is definitely an interesting view and you can't see the addition from the front. That in itself is amazing. That is universal sign. Too bad it is wrong about entering so perhaps in the future it will be removed. Interesting architecture. Hello, the new modern section really stands out. Happy Thursday, enjoy your day! Are those solar panels ? Interesting next to the Gothic looking older part! Yes, it's like a natural blending almost.